How do we save the planet for future generations? We can start by cleaning up our oceans and bringing potable water to areas that desperately need it–which is exactly what the engineers at UCLA Samueli are pursuing. Jennifer Jay, Professor of Civil and Environmental Engineering, her doctoral student Megyn Rugh, and the Jay Research Group are wiping out gnarly bacteria in oceans with the help of local surfers. This past April, doctoral student Megyn Rugh found bacteria responsible for several difficult-to-treat infections at surfing beaches in Southern California. The bacteria, MRSA (methicillin-resistant Staphylococcus aureus) and VRE (vancomycin-resistant Enterococcus)–both of which are categorized as “Serious Threats” by the Centers for Disease Control (The CDC), are known entities in nearby waters, and can cause skin infections and are resistant to several antibiotics. Some people can even carry MRSA on their skin or in their noses without showing symptoms. As a surfer herself who grew up riding waves north of Los Angeles at Morro Bay Rock, Rugh teamed up with her advisor Jennifer Jay, a Professor of Civil and Environmental Engineering, to study how this pathogen colonizes in surfers. Sea Grant, a federal-university partnership that works to create and maintain a healthy coastal environment provided seed money for the research, and the Jay Research Group also partnered with Surfrider Foundation, Heal the Bay, and the Institute of the Environment and Sustainability at UCLA. 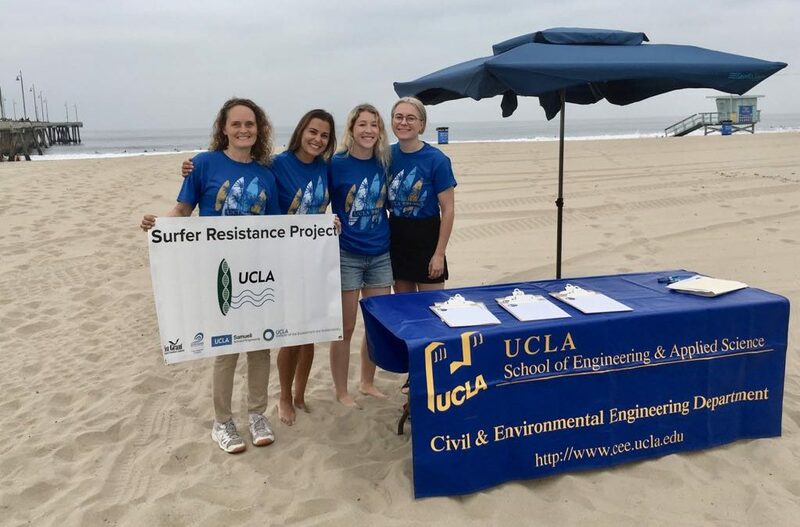 This summer, Jay Research Group members, along with summer interns and volunteers, are reaching out to the local surfing community. Surfers and a control group are being asked to donate nasal swabs and answer questions about water exposure, health, and antibiotic use through the fall and winter. DNA will be extracted from one nasal swab while another will be used to culture antibiotic resistant pathogens. While the short-term goal is to protect the health of surfers and other ocean swimmers, the team hopes to address the issue of rising antibiotic resistance to help keep our oceans clean.